Subscribe our best of the best paranormal and ghost video on youtube. Now you can read our website in your own language. Please choose your own language and the translation service do the rest for you. Welcome to Malaysian Paranormal Research official website. This site has been officially opened on the 29th December 2007. The latest paranormal research findings. "Research mean that you don't know but are willing to find out"
This section is a journal where were the researcher use to share latest issues in the paranormal and ghost research. Click here to visit the journal or click the latest updates below. JOURNEY BEYOND THE UNKNOWN..........THE CHAPTER BEGINS AS WE UNLOCK THE DARK HIDDEN SECRETS. WE TOUCH THE SPIRITS WITH LOVE AND HUMILITY . With Love and respect, feel free to browse and search for facts and view the journey beyond death with us and experience it first hand. Its time to realize the truth. Understand the process of life after death which will happen to every one of us some day because its a natural cycle. See and experience for yourself that life does continues even after death. Death is simply a transition to the after life. Life after death is simply a journey to a different realm or a different dimension as we continue making progress to the higher dimension. With the universal love, we create the ultimate reality within the eternal now...Life is truly a choice. December 28th, 2007 by Arwin John. 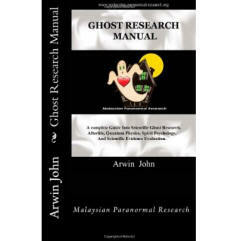 GHOST RESEARCH MANUAL BOOK by ARWIN JOHN. Ghost Research Manual is the embodiment of Arwin John's years of ghost research & field investigations. He has accumulated more than 160 Ghost videos, hundreds of ghost photographs & EVP recordings throughout the years. He is sharing his entire knowledge with you so you can acquire the experiences, knowledge & the understanding you need to be a ghost researcher & a paranormal investigator. Order yours now. The MPR name and all things within this site are the property of The Malaysian Paranormal Research. Reproduction of any material without written consent is a violation of the copyright laws, and is strictly prohibited. ©2007 Malaysian paranormal Research. OUR MALAYSIAN PARANORMAL RESEARCH LOGO. Bookmark our site using your mobile smart phone. September 22nd, 2011 by Arwin John. 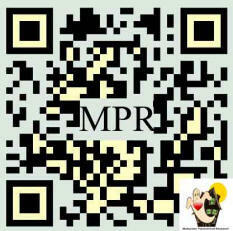 This QR code contains our website address and by using a camera phone equipped with the QR reader software, you can scan this image of the QR Code causing the phone's browser to launch and redirect to the programmed URL. Also to bookmark our website as well. Join us into the research of the unknown. Join us into the research of the unknown and be the first to read our article when it posted. Furthermore, we share in-depth our knowledge about paranormal and ghost research. Therefore, our research is a research that opens the door and unlocks the secrets of unexplained mysteries which reveal the truth. At the moment we have 1216 members. Watch Our Best of The Best Ghost Videos Hosted in Youtube. All our video recording has been uploaded under youtube. You may choose to view them by visiting our Ghost Video Page. Below is a selection of my favorite and the best video recordings from my video collection. Nevertheless, this is just a fragment of what you about to explore at our Video Page section as we have more than hundred's of ghost video clips in our collection database. Click here to watch all the best of the best ghost videos from our research findings on YouTube. Hit the 'Back Button' of your browser to return to this page. Statistics based on field investigations completed. This field investigation planning based on current weather forecast. We Share our paranormal research findings. December 30th, 2007 by Arwin John. Malaysian paranormal Research was founded in 2007 by Arwin John who is also a member of the International Ghost Hunters Society. Malaysian Paranormal Research was founded in 2007 by Arwin John who is also member of the International Ghost Hunters Society and the International Ghost Hunters Inner Circle Society. Malaysian Paranormal Research has been associated with the IGHS since 1st December 2007. We Research the unknown with respect and kindness, and touch the souls with love and humility. Begin your journey to the world of mystery. Our collections of paranormal photos, Electronic Voice Phenomena (EVP) and Ghost Videos is one of the largest collection online in Malaysia. We continue our research into the unknown and share our findings through our official website The Malaysian Paranormal Research, magnifying the world of mystery. Some of the photographic evidences on this site have been reviewed and proven by Dave Oester, DD., Phd on the basis of exceptional photographic evidence of life after death, and which have been awarded the Floating Orb Award and received another 39 awards from different Paranormal Organizations, clubs and individuals as a recognition of the research findings. The best time for ghost hunting. The Lunar Calendar and Ghost Weather. Malaysian Paranormal Research has found that the lunar calendar has nothing to do with Ghost activity. Find out The moon phase, doest it really have impact on ghost hunting? Dr. Dave Oester is the author of the ghost hunting formula related to weather patterns. The formula is as follows: Sunspots = Solar Flares = Solar Storms = Magnetic Shift = Increased Geomagnetic Fields = Increased Ghost Activity = Good Time for Investigations. Watch out for Geomagnetic to read STORM for best times for investigations. Dr. Oester developed this formula in 1994. Thanks to Dr. Oester, solar weather readings are now displayed on most ghost research/hunting web sites. Dr. Oester also formulated in 1993 that two or three days on each side of the new and full moons are also the best times for conducting investigations due to peak geomagnetic fields. Since adverse weather conditions such as thunder storms, heavy rain and other environmental hazards can be so dangerous therefore our field investigation on the paranormal will be only conducted during fine weather. field investigation planning are based on current weather forecast. Our club has been associated with the International ghost hunters society. You may click the banner above to view it. Banner and advertisement space available. Promote your product or services today, Email me. Our Club is also in the hall of fame. You may click the image above to view it. IGHS CERTIFIED GHOST HUNTERS AND RESEARCHERS. we are also certified by the IGHS as ghost researchers. You may click here to view it. ARWIN JOHN - Professional researcher. © 2007-2018. Arwin John. All Rights Reserved.